Usually, when I talk about my sister Maureen, I refer to her as the Queen of Substitutions. She'll take a recipe and change it to fit whatever ingredients she has in the house and it always turns out fabulous. Today, however, I'll talk about her ability to create amazing dishes with no recipe at all! She'll go to a produce market or grocery store, see what looks good, and create something fantabulous, even if she's using an ingredient that she's never tried before. Now THAT's talent!!! Remove casing from sausage. Crumble and cook in a large saute pan. Remove from pan. Set aside. Add chopped onions and poblanos to the sausage drippings. Saute until soft. In a separate bowl, scramble the eggs with a few glugs of half and half. Now it's time to assemble everything! Spray tortillas with vegetable oil spray. Heat in oven for about 3 minutes or until pliable. Shingle them across the bottom and up the sides of a 9x13 casserole dish, cutting them if you need to in order to make them fit. 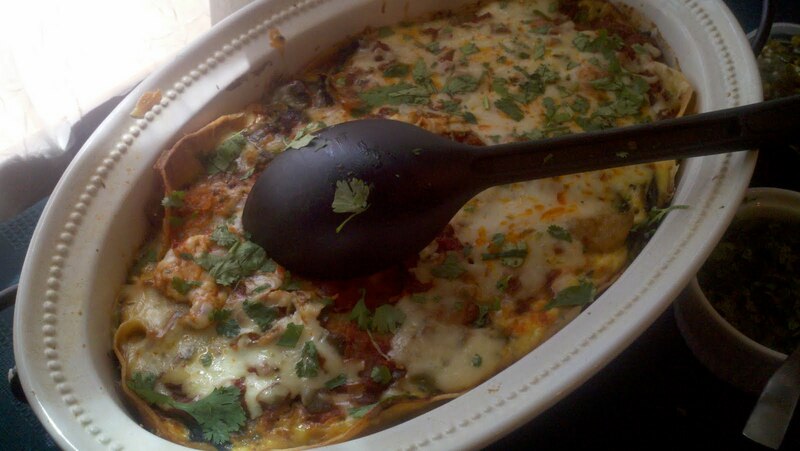 Layer the casserole in this order: Sausage, shredded cheese, potatoes, poblano/onion mixture. Pour scrambled eggs over everything. Top with the entire jar of salsa and more cheese. Place casserole in oven. Bake for one hour or until set in the center. To serve, cut into squares. Top with cilantro, pickled jalapenos, and additional salsa, if desired. If you'd like to tone down the heat a little, just choose ingredients that are less spicy, such as a milder salsa, a sweet sausage, and regular Monterey Jack cheese.